When I was 12 or so, I remember my Uncle Jim having a Class 3 firearms permit, and as the possessor of such paperwork, decided it necessary he own both a Colt M16A1 and an MP40 “Schmeisser” machine pistol. While the MP was interesting, especially to a 12-year-old, it was the M16 that held my attention. The fact he also owned a .22 rimfire bolt assembly for the piece certainly helped; not only with the enjoyment factor, but more notably from a financial standpoint. It was a fun gun — nothing more, nothing less. Pure, unadulterated entertainment in black metallic form. That was 35 years ago, if memory serves, and in the time between Then and Now, I haven’t so much as slipped a magazine into an AR-esque military rifle. This no-fire status changed recently, however, when I received Remington’s Model R-25. Futuristic in appearance, the mottled green thing lay there in its hard case, ugly as a 1980 Chevrolet Citation. I didn’t know whether to pick it up and fondle it, or poke it with a stick and hope for the best. Fortunately, I resisted the urge to simply close the lid and wander away — and I’m glad I did, as I found what Big Green refers to as a “masterpiece of game-dropping performance that will load any camp’s meat pole with unrivaled efficiency” to be quite the shooter. Available in .243 Winchester, 7mm-08 Remington and .308 Winchester, the R-25 is a gas-operated AR-style semi-automatic rifle. All but the barrel and dust cover are cloaked in Mossy Oak’s ‘Treestand’ camouflage pattern. In true AR style, the R-25 consists of both an upper receiver, which includes the bolt assembly and barrel, and the lower, comprised of the trigger group, magazine, toggle safety and bolt latch. Both upper and lower are milled from aluminum; the tubular hand guard is also aluminum, all of which help keep weight to a minimum. The 20-inch barrel, with recessed crown, is fluted, and is wrapped at 5.5 inches rearward in a gas block cut with a 1.5-inch Picatinny rail, and secured by twin set screws underneath. The stock is made of a rugged Zytel plastic, with a .5-inch hard black plastic pad, and aluminum-doored cleaning gear compartment measuring 1 x 2 x 8.25 inches. The pistol grip, too, is cut from Zytel. The R-25 arrives sans sights; however, and in addition to the foreward Picatinny rail, the upper includes a 6.75-inch Picatinny for scope or tactical optic mounting. The left side of the receiver harbors the bolt release latch, as well as the toggle (two-position) safety. The magazine release, forward (bolt) assist, and dust cover, all blued by the way, are on the right, as is an angled brass deflector. The charging handle, also blued, is located behind the upper Picatinny rail. Slings swivels can found on the hand guard and stock. 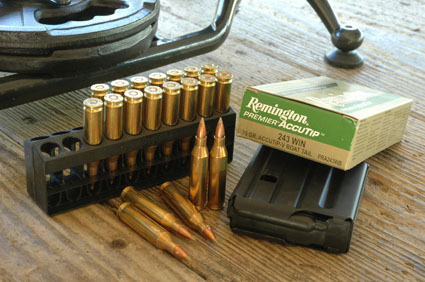 Cartridges are fed via a supplied four-round magazine. I’m somewhat of a traditionalist when it comes to weaponry, especially in terms of aesthetics. So don’t hate me, AR fanatics of the world, when I refer to the R-25 as homely. Myself, I think she would look better draped in her original black finish; however, I’ll admit that Remington’s succeeded in creating an old-school camouflaged autoloader wearing radically new clothes. Regardless of how you feel about its appearance, good looks don’t consistently kill whitetails or hogs or coyotes or what have you. Accuracy and reliability do, and in this arena, the R-25 is unequivocally stunning. 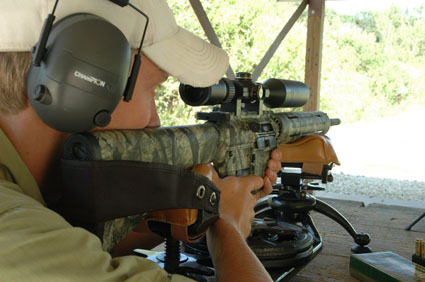 Filled with Remington’s 75-grain Accutip-V Boattails, and topped with an Alpen APEX 6-14x44SF cranked up to 10x, the gun printed an amazing .625-inch group at 50 yards. Not three shots or five shots, but 10 rounds split evenly between two shooters into a ragged cloverleaf just barely 5/8-inch from center to center. I’ve always been impressed with the .243 Winchester in terms of accuracy, and this particular piece was certainly no different. True, groups did open up a touch at 100 yards; still, all of our three- to five-shot clusters measured between 1.25 and 1.5 inches. Behind the plastic stock, the R-25 did indeed take some getting used to. The factory trigger has a six-pound break, which complicates things, but we managed to print more-than-acceptable groups time and time again. I wouldn’t hesitate a heartbeat to pull the R-25 from the cabinet and carry it afield for anything from whitetails to coyotes. While we’re on the topic of carrying things, the R-25, at 11.5 pounds, 19 ounces of which is scope, is anything but a featherweight. That said, if you’re of a mind to sit in a box blind, ground blind, or tree stand, then it doesn’t matter. And the R-25 is exceptionally easy to break down for routine maintenance. As is often the case upon receiving a new anything, my initial move is to take it apart and then, hopefully, put it back together. Here, the R-25 is practically mindless — push two pins, and the upper and lower receivers separate. From this point, it’s a truly simple matter to reduce the weapon’s innards to individual parts, clean thoroughly and reassemble. Running anywhere from $1,350 to $1,500 retail — and that’s before you begin the addictive process of buying and attaching aftermarket gadgets and gizmos — the R-25 makes for a somewhat spendy deer rifle. However, the weapon doesn’t falter in the field accuracy department nor, at least during our live-fire sessions, in terms of reliability. And as far as getting noticed when you pull it out of the case at this year’s Upper Midwest deer camp — well, there should be no shortage of interesting comments.